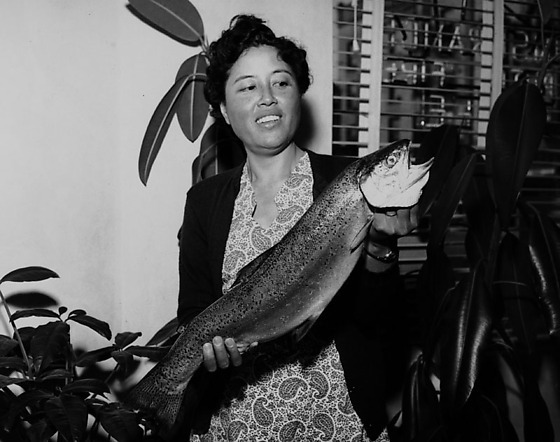 A woman, Mrs. Amagusa, holds her trout, the biggest catch in the Sunrise Rising Club for 1951, at the Hirohata Insurance Office in Little Tokyo, Los Angeles, California, May 2, 1951. Amagusa wears a black sweater over a paisley dress. Also includes a man in suit and eyeglasses, Mr. Frank Hirohata, measuring the trout. 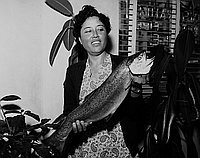 Written on original negative envelope: Hirohata Office -- Mrs. Amagusa with Fish. Hirohata Insurance Office was located where Oomasa Restaurant is currently located in the Japanese Village Plaza on 1st street.